Want a Matted Print of Any Photographs You See Here? e-mail. If there's something you don't see on that page, but would like to order, go ahead and ask. With some exceptions, just about everything is for sale. Lots of stuff added as of January 7! My dislike for Halloween has been documented before. I especially hate getting dressed up. I'm just not a full-on costume girl. If I'm forced to dress up, as I've said before, I'm going as a bunny. That's all you're going to get out of me, and even that will not come without a fight. That bee costume right there? It was probably one of the last times I got dressed up on Halloween that didn't involve hand-to-hand combat with my mother. Oh, but there was the year I went as Princess Leia. But that probably doesn't count, because I was convinced that I really was her, and was only with my family in Fremont, California through some horrible mixup that Han Solo and Luke Skywalker were sorting out, and they would be by to rescue me any minute. It really is a shame that for most of my life, I didn't enjoy costumes, because my mom is a hell of a sewer. I'm pretty sure she made the bee costume. One Halloween when I was 11, she made my 9-year-old brother, David, an entire Ewok costume. No, I mean a full-on, straight-off-the-set Ewok costume. Fur and eyes and teeth and everything. That thing was a masterpiece. The costume enjoyed life beyond Halloween, too. My cousin Jason and I put David in the costume one day and walked him over to Mr. and Mrs. McDonald's house. Mr. and Mrs. McDonald were my grandparents' landlords and neighbors, and were the nicest people. Mr. McDonald had had a stroke before we ever met him, and he couldn't talk. But I could tell from the way his eyes twinkled whenever we visited him that he enjoyed us. Either that, or he was longing to tell us damn kids to get off his property and leave them alone once and for all. "Look what we found, Mr. McDonald!" Jason said. "It's an Ewok!" Mr. McDonald looked at my brother and reached over to pat his head. I think he totally believed we had found a real Ewok. OK, perhaps not. To be extra convincing, though, we'd say, "Well, we have to be getting the Ewok home now! He misses his family." Then we'd run back to our house, get my brother out of the costume and then send back him over there all breathless. "Was there really an Ewok here?! Why didn't anyone get me?" God, poor Mr. McDonald. He did a good job of pretending we didn't annoy the hell out of him. My least favorite costume memory is the year that mom forced me to go to a church Halloween party when I was 15. After much screaming and yelling, I finally relented and said I'd go, but that I was not wearing a costume. "Oh, yes you are!" mom said. She pulled out a Snow White costume she had made for herself the year before and reminded me just how hard she had worked on it. I have to admit, it was a great costume. But still. 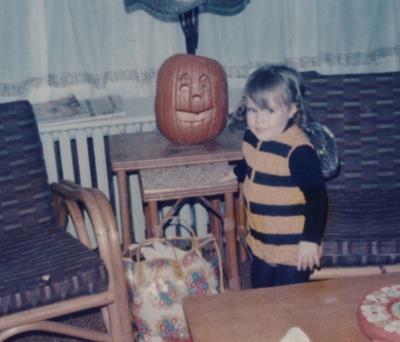 Being forced to dress up as an icon of innocence and good cheer when I was at my most surly and rebellious was just cruel. I put on the costume and spent the night at the party hiding under a big coat, sitting in a corner drinking punch and pouting until it was time for the big costume contest. And I was pissed, because no one had ever mentioned a costume contest anywhere along the line. I tried to get out of participating, but a group of people begged me to take off my coat so they could see the costume. I refused and refused until finally, just to get them to leave me alone, I took it off and put it back on a minute later. And what happened next is something I swear they did just to torture me: They voted me the winner of the contest. I don't remember what, if anything, I won. But mom sure was vindicated.